10 security guards of the Imperial Palace Police, including 8 female staff, have dispatched to Ofunato city. 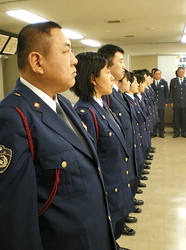 The kickoff ceremony was held at headquarter of Imperial Palace Police in the Palace on April 26. They usually assign specifically for guard to protect Emperor and Empress, as well as other Imperial families. The dispatch of staff to the stricken site of the natural disaster is the first time in their history. The Imperial Palace Police are specifically keeping guard over the imperial family. The security party is named ‘Himawari-tai’ imaged after ‘hope and smile’. The Imperial Palace Police was established for keeping guard over the imperial family in Meiji 19 (1886). This is the first time of the dispatch to the stricken area caused by natural disasters since its long 125 years history of the organization. The party is organized with 10 staff members including 8 female guards and is based on within the jurisdiction of the Ofunato Police Station. They are going to go around shelters in both Rikuzen-takata and Ofunato cities for promotion of crime prevention and consultation with refugees in the shelters by May 6. Mr. Manabu Fujita, the commanding officer, expressed his will at the kickoff ceremony. ‘We will perform our duty sincerely and kindly having with hope for reconstruction.’ The commander’s home town is Miyako city in Iwate where was also greatly damaged. ‘We would like to help refugees with paying careful feminine attention.’ Ms. Tomoko Nishimori, a security staff told what she plans to do on her duty after the ceremony.